Update: Margaret's cookies were made with mixed peel instead of uncrystallized ginger and they tasted awesome except that the mixed peel hardened upon baking. 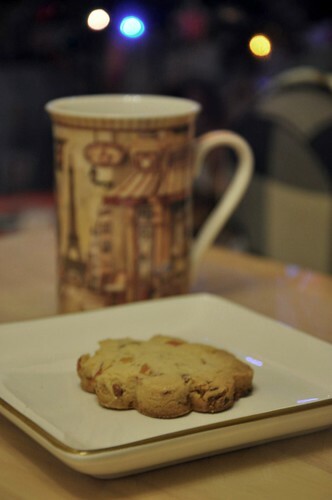 I did the cookies according to the recipe and they didn't taste good when hot but after a day, they were great too. Halving the ginger gave even better results because then the ginger wasn't overpowering. I am ready to go home tomorrow night even though I am enjoying it here. The weather has been wet most of the whole week but yesterday it turned not just wet but cold (9 C) and windy also and that is truly miserable and uncomfortable. I'll be glad to be out of here and back to where I can sit drinking wine on my patio in shorts and T shirt. Here nobody seems to sit out in their patios even if the Oz magazines are splashed with that seeming but wishful lifestyle of outdoor kitchens and parties in the patios. Which we have in Malaysia. My hands are crinkled like crepe paper no matter how much and what I slather on. La Mer doesn't work here. Just like how the studies reveal that Japanese women are just as likely to get breast cancer when they move to the US, because of the high fat and cholesterol diet, I realize that it's not that we Orientals look younger than Caucasian women. If you live in the humid tropics, you will age more gracefully than people in Canada (where it's drier than Oz; in winter the dry air gives off static charges that make your hair fly and clothes stick together) and all those cold countries. There's no ideal climate. Wait. I think Vietnam and all those Indo-Chine counties may be the answer. I'll move there if they sort their political ideologies out. I only have two days to shop but now it's mid day and I'm still in the apartment. It looks so cold and windy out. Reminds me of windy and cold Wellington, NZ. Now I know why isolated NZ and OZ were good for punishment in the old days. Or even now. 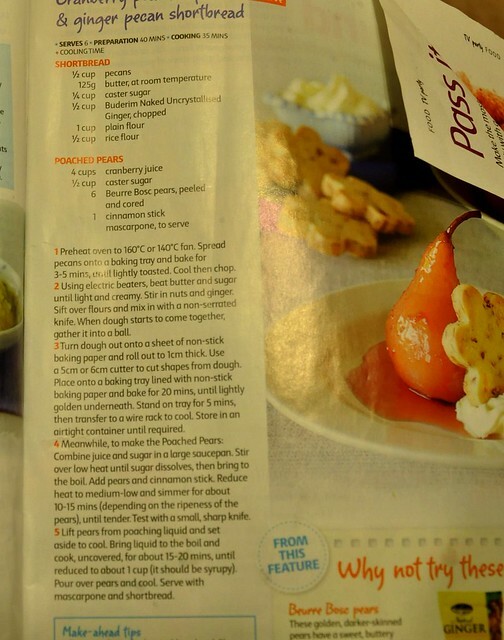 If you haven't made your Christmas cookies yet, here's a yummy one to try. I had these at my friends Margaret & Simon's house last night and if it wasn't because I am watching my waistline for Christmas and New Year's dinners, I would've eaten a plateful of them. Margaret's house was decked in lights, her tree pretty with ornaments collected from all over the world. 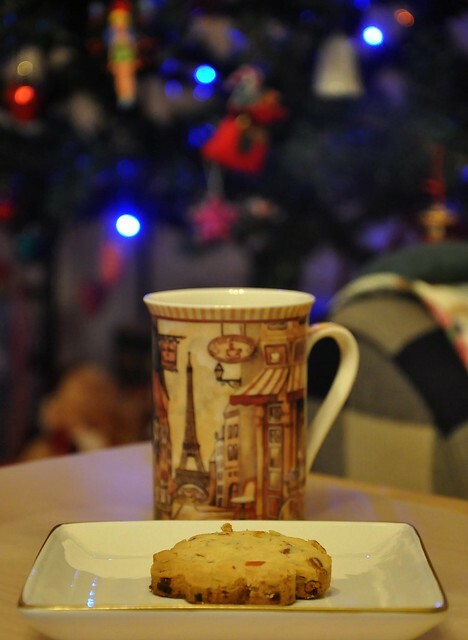 We sipped spiced tea and munched on the cookies while watching Nigella cook for Christmas. We all agreed that the woman is seductive (Nigella in a red satin robe! Nigella close up licking melted chocolate! Nigella glancing at the camera with parted lips! )and too distracting for a cooking show. It was a cosy and comforting evening and the first time I really felt the Christmas spirit so far. Note: I advise that you replace the uncrystallized ginger with mixed dried peel and fruits which have been washed, dabbed dry, chopped and soaked with some rum. Merry Christmas Terri! Just in case I forget later. Again congrats to Yi on her graduation. Bliss. Wishing a blessed Christmas and Happy New Year to you and all at home. This cookie sound so good. Have a nice and loved day!! sonia: wishing you a wonderful 2011 n lots of good food! laura: you too! take care n i am excited for you about your move.